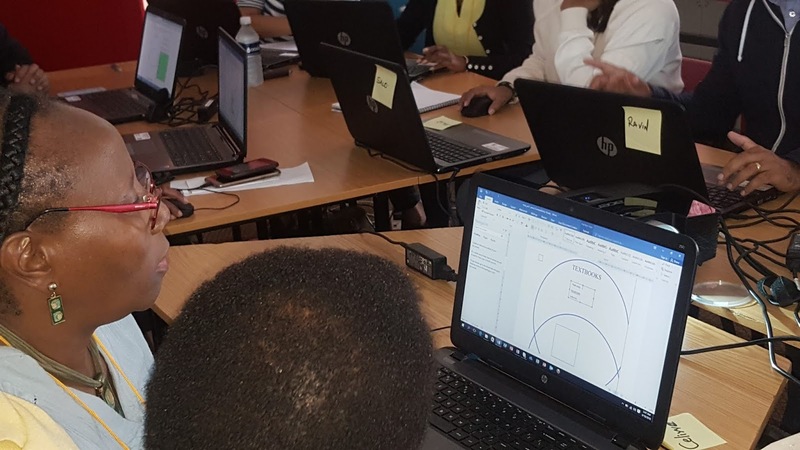 In May and June 2018 two groups of FET KwaZulu-Natal Subject Advisors, completed the five-day Intel Tablets in the Classroom at the Ukhahlamba Education Centre in Bergville, facilitated by Hlengiwe Mfeka and Senzo Ngcobo of SchoolNet SA. This blogpost highlights some of the modules that were used to familiarize subject advisors with the features of tablets and strategies for teaching and learning in mobile environments. In the icebreaker activity, delegates used the ArtRage app to introduce themselves by drawing an animal with which they share some characteristics. This was a great way for delegates to learn a little bit about their peers, whilst exploring a tool on the tablets at the same time. Reflective activities for this course were done using the Evernote app – providing teachers with an opportunity to both record their learnings about tablets, whilst also exploring the functionality of this online note-making tool. The activity around basic tablet functionalities was done using the jigsaw strategy. This allowed subject advisors to explore the tablets, and collaborate with one another, and because each subject advisor had to teach their colleagues about the function he or she had been assigned, everyone became actively involved. The “give-one get-one” strategy provided an opportunity for subject advisors to learn more about Media Camera, Pixlr, ArtRage, Sketchbook, Evernote and Foxit Reader. Participants were divided into groups of four and had to explore their assigned app and how it could be used in the classroom. The groups then circulated to provide an opportunity for each group to share their discoveries with groups that had explored other tools. After the Random Team Generator was used to assign subject advisors to groups, each group member was appointed as their team’s photographer, annotator, publisher or student team leader. Each group was tasked with finding objects in and around the classroom beginning with their randomly assigned alphabet letter. These objects were then photographed and the photos were annotated, shared by Bluetooth and published to Google Drive. 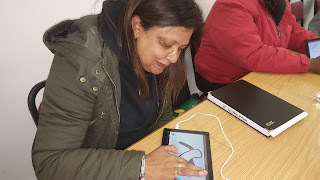 In addition to being lots of fun, the activity demonstrated a range of tablet features and yet another way in which a teacher could structure an activity using devices for their learners to collaborate. The afternoon snack session involves delegates learning how to do something of their choice. One group expressed an interest in being able to record and upload a video from their tablets to YouTube and to then share this link. The subject advisors were thrilled to learn how to do this, and felt this was a relevant skill for the teachers in order for them to share their video lessons with their students online. Whilst there are thousands of educational apps available – teachers need some guidance in determining the best app for their audience and purpose. The subject advisors were shown how to use an Educational App Rubric to review an app’s educational value and learning impact prior to installing it. They were also given tips such as checking an app’s reviews and ratings, and determining whether an app was free before downloading large apps that may prove to be unsuitable. Teachers can ask learners to raise their hands in class to answer questions or to determine how well a concept was understood but shy learners seldom get involved, and weak learners don’t volunteer to answer leaving the teacher unsure about who actually understood what was being taught. In the Tablets in the Classroom course, delegates tried out Poll Everywhere, Socrative and Kahoot to see how these tools can be used to encourage audience engagement. The subject advisors then set up their own quizzes to see that it is easy to create an interactive lesson and shared their learnings using the Pair and Share strategy with a subject advisor who had explored another assessment tool. Towards the end of the course, subject advisors had a growing enthusiasm for using tablets in the classroom, but realised that the tools would need to be effectively managed. 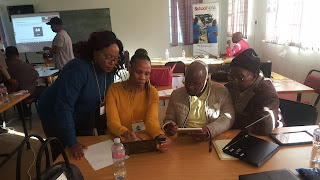 They appreciated the session on classroom management as they will be able to share the various strategies with teachers in their districts that have access to tablets at their schools. On the final day of training, subject advisors completed some portfolio activities to showcase what they had learnt. The highlight of the week’s training, for each group, was an elegant gala dinner sponsored by Alpine Heath. This exclusive event included presentations by subject advisors on what they had done with their teachers since the initial training session, and the presentation of certificates. The subject advisors completed two courses in ICT integration, namely ‘Using Digital Resources in the Classroom’ and ‘Introduction to Tablets in the Classroom’. 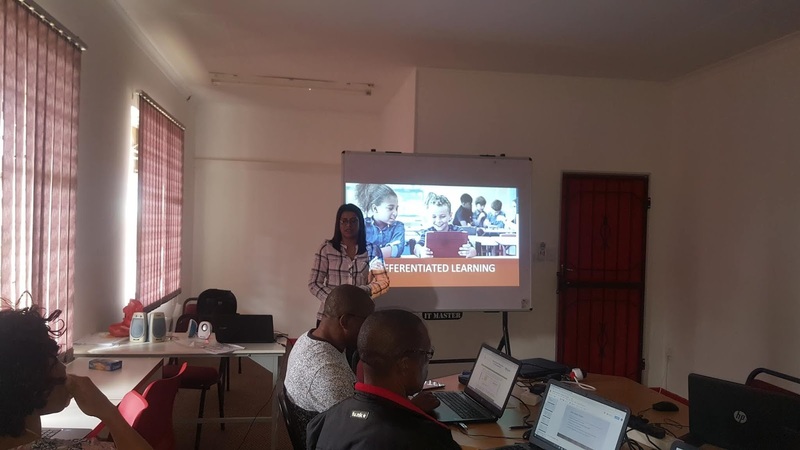 These proved to be a great success as participants felt confident to go back to their districts and effectively support their teachers to implement the digital literacy framework and make it a living document in their respective schools. The WhatsApp group created during the workshop continues to buzz as subject advisors share tips, pictures and stories of their implementation after the workshop. If your school has invested in tablets, or is running a Bring-Your-Own-Tablet system, please be in touch with info@schoolnet.org.za for a quote on us facilitating the Intel Tablets in the Classroom workshop for your teachers. 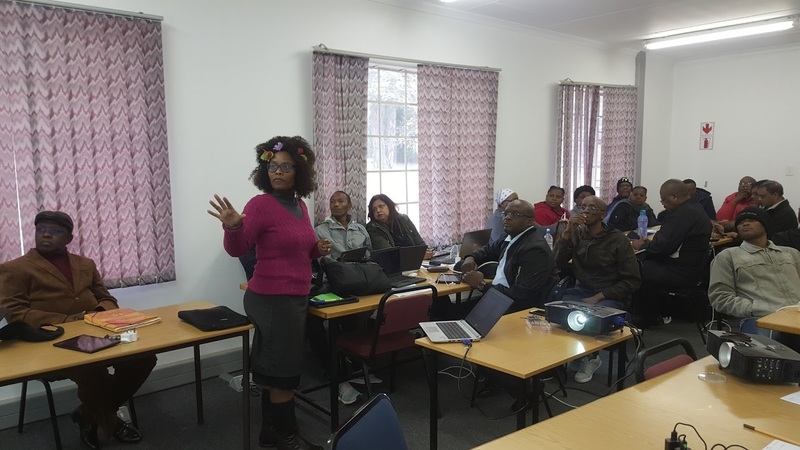 We would also be willing to offer training for subject advisors, similar to the workshops we ran in KwaZulu-Natal, in other provinces or districts. April 2018 was a busy media month for SchoolNet - and you may have seen us on TV or heard us talking about our Learning Gains Through Play project on the radio. The need to share important findings from research conducted over four years as part of the DG Murray Trust-funded study on Learning Gains through Play prompted SchoolNet South Africa to issue a press release in April 2018. This project had shown that exposure to digital educational apps and Xbox Kinect games had significantly improved second language skill in the Foundation Phase. Learners from the 10 project schools had consistently outperformed learners at the 2 control schools in a range of literacies over the previous four years but the improvement in second language English acquisition among the isiZulu and isiXhosa-speaking learners was the most remarkable. Within the week of the media release, several radio stations contacted SchoolNet for interviews about the findings. These included Cape Talk Radio, the 702, Turf Radio, Alex FM, SAfm and RSG. Both Omashani Naidoo and Janet Thomson fielded questions about the research from these radio stations. Janet was especially impressed by Azania Mosaka of 702, who was well informed, asked great questions that showed insight into relevant issues related to the project. Listen to the podcast here. 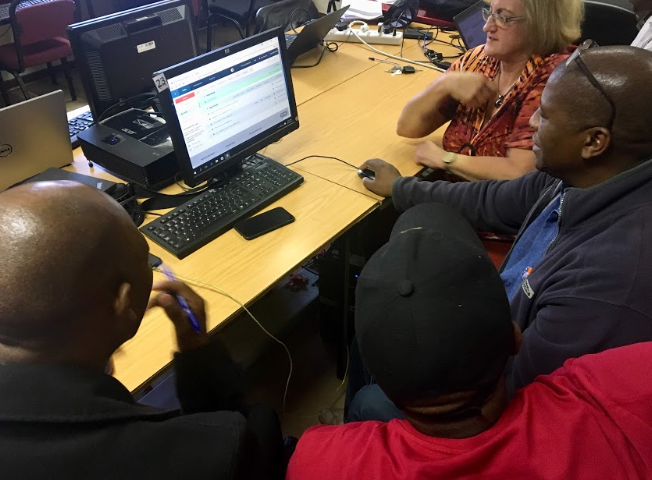 For the Afrikaans interview on RSG, Dr Jacqueline Bachelor, the Programme Manager of Initial Teacher Education and Senior Lecturer in mobile and blended learning at the University of Johannesburg, was interviewed. Listen to the podcast here. Omashani was interviewed by Stephen Grootes on SAfm. The podcast can be heard here. Two notable online publications featured the SchoolNet media release; Arthur Goldstuck’s Gadget piece can be viewed here and the IT online item appears here. On 30 April 2018 Omashani Naidoo was invited by SABC 3 TV to be interviewed by Pearl Shongwe on SABC 3's Morning Live show. Interview can be seen here. 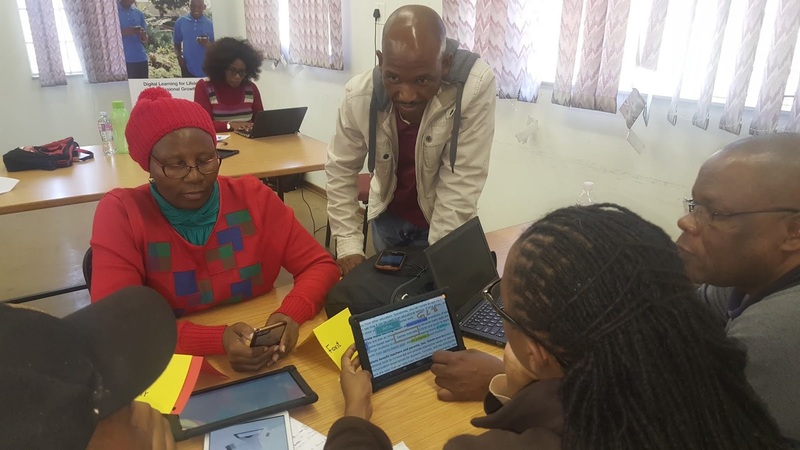 Questions centred around the positive research findings that digital learning could have such a profound impact on literacy at a time when the release of the PIRLS results had shown that 78% of Grade 4 learners had not been able to read for meaning. Interviewers from the different media channels chose different angles to hone in on. Some of them preferred to talk generally about digital learning and what SchoolNet SA does. However, the possibility that exposure to digital apps and games could be the answer to improving South Africa’s reading crisis came up in most of the interviews. A number of the interviewers demonstrated that they had engaged with the detail in the press release and had considerable background knowledge to support their questions. SchoolNet SA was grateful for the exposure that our organisation gained from the various interviews. They showed that South Africans are definitely interested in the power of technology to address the reading crisis in South Africa as well as to create more engaging and powerful teaching opportunities. We hope that some of the interest generated by the interviews will lead to future projects where more teachers and learners benefit from projects similar to Learning Gains through Play. Subject Advisors are tasked with helping teachers to deliver their content effectively, however many subject advisors last taught before digital resources were widely available at schools, or they support teachers at schools that are new to making use of online resources. 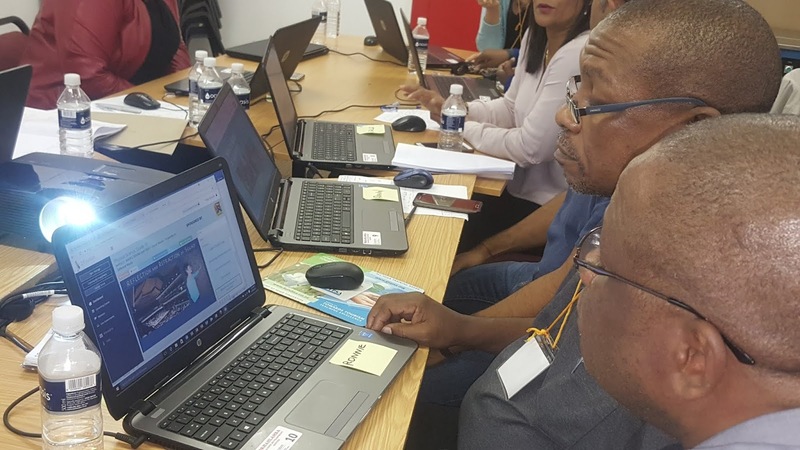 In April and May 2018, The KwaZulu-Natal Department of Education contracted SchoolNet SA to provide professional development to FET subject advisors so that they would be better equipped to support teachers to use digital resources. Two groups of subject advisors completed the “Using Digital Resources in the Classroom” course. The first workshop, for 36 subject advisors, took place between 16 and 20 April 2018 and the second workshop, for 34 subject advisors, took place 7 and 11 May 2018. 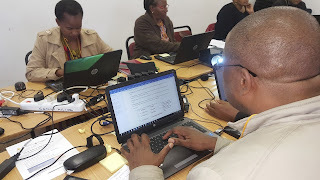 Both sessions took place at Ukhahlamba Education Centre in Bergville, where there was good connectivity and a laptop for each participant to use. Hlengiwe Mfeka from SchoolNet SA and Senzo Ngcobo, a SchoolNet consultant, facilitated the sessions. What does the ‘Using Digital Resources in the Classroom’ course cover? What is a digital content resource and how can I most effectively use it in class? As this workshop was for subject advisors, as opposed to teachers, the final day of the workshop was used to develop action plans for the subject advisors to share what they had learnt about integrating digital resources with the teachers in their districts. In this way the learnings could be shared, leading to better classroom practice. Mr Masondo (Deputy Chief Education Specialist for KwaZulu-Natal) welcomed participants and gave an address highlighting the importance of this professional development to empower and develop subject advisors to efficiently support their teachers. After the introductory ice-breaker, and an overview of the course objectives, the group compared digital content to textbooks using a Venn diagram and made a decision making grid to explore the role that digital content resources play in teaching and learning. 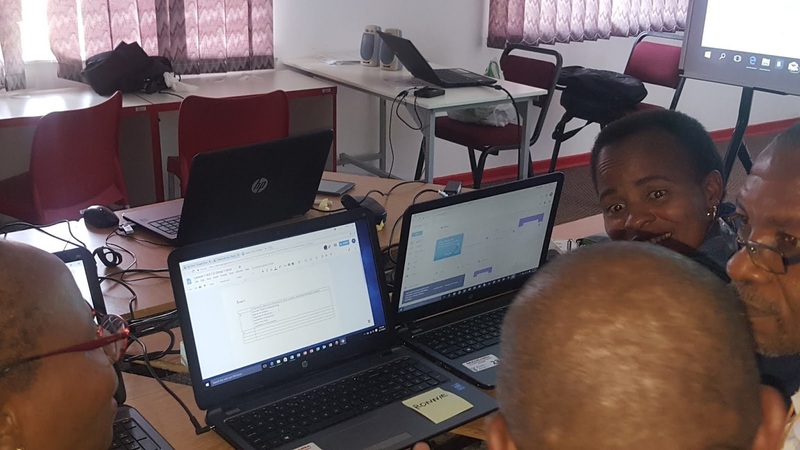 These activities were a success because they not only got the group thinking about incorporating digital resources into lessons, but also using a range of digital tools such as Google collaborative documents to document their findings and the 2Enable platform to access content. Participants also learnt about the T-PACK model and completed a number of collaborative activities focusing on using digital content resources in different ways in the classroom. On the second day of training, delegates got to grips with the SAMR model and completed an activity in which they related the transformational impact on learning to their own subjects. 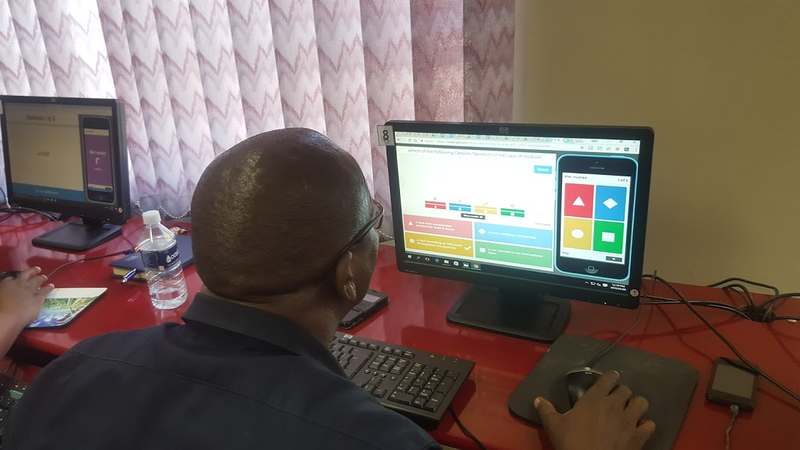 Later the participants played a Kahoot online quiz which helped further reinforce the SAMR model and led to lively discussions. 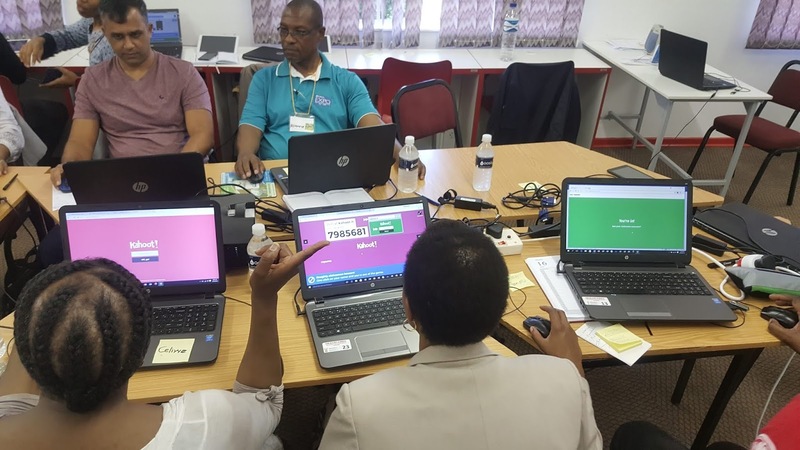 Teachers also had an opportunity to develop their own Kahoot quiz and to test their colleagues – which allowed them to see how teachers could use this fun and easy tool in a classroom. Delegates tried out some online assessments related to their subjects using the free version of the 2Enable platform. Whilst the group noted some features that they thought could be improved, they were able to see some of the advantages of online assessment including differentiation, instant feedback, and being able to find a range of existing resources related to a range of topics without a teacher having to create these. One of the aims of the Using Digital Resources course is to not only discuss instructional design but also to model a range of facilitation techniques. In the group-work sessions, subject advisors had an opportunity to experience the jigsaw strategy. 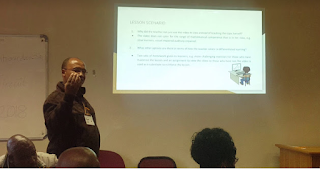 Through this they realised that it was possible for members of a group to become experts on one aspect of a topic and to then teach their peers and that it wasn’t always necessary for the facilitator or teacher to be the only source of knowledge in a classroom. Subject advisors noted learning was seldom differentiated as there was such pressure on teachers to complete the syllabus. 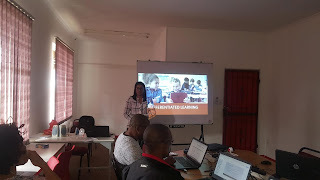 The group noted, however, that digital resources could help a teacher to find appropriate resources for different skill levels within a class and that they could also be effectively deployed in multi-grade classes. Trying out activities that used digital resources, helped subject advisors to realise that teachers should be encouraged to shift from traditional spoon feeding to become facilitators who inculcate deep learning skills. 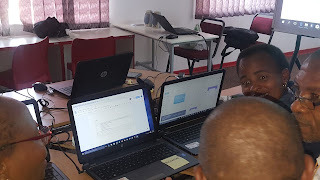 In the session on planning to integrate digital resources, the facilitators unpacked the ASSURE Lesson Plan Rubric and subject advisors worked first individually and then in pairs to develop and asses one another’s lesson plans. This activity helped to get the subject advisors more comfortable about giving feedback on lesson plans and using Google Drive for online collaboration. What computer skills are needed for the ‘Using Digital Resources in the Classroom’ course? Delegates attending this course should ideally already have some digital skills as the aim of the course is to show teachers how to access and use a range of digital tools to enhance their lessons. Of course, any time a teacher uses the computers he or she will continue to develop their digital literacy skills at the same time. 77% of subject advisors on this course said that the skills and knowledge gained from this course had exceeded their expectations, with the balance of subject advisors (22%) saying that the course had mostly met their expectations. Please contact info@schoolnet.org.za if you would like more information about the "Using Digital Resources" course for teachers or subject advisors. Are you looking for a global project to get your learners doing something positive towards tacking the Sustainable Development Goals? Do you want to showcase your community and its challenges and solutions on a global stage? Do you want your learners to make exciting media - but only have access to a Smartphone? MY World 360° invites youth (ages 5-24) worldwide to create 360° media to share their perspectives and advance positive action toward the Sustainable Development Goals (SDGs). The aim of MY World 360° is to share the stories of the people behind the SDGs including those whose lives are most affected and those who are taking action to make their success a reality. Start by exploring the Sustainable Development Goals and how they are relevant to you and your community. Have conversations with people in your community to discover what issues are important to them. The MY World survey can be used as a tool to start the conversation and ask yourself and the people around you what stories need to be told. You’ll need to learn a bit about 360° media, a format that captures in every direction at once — up, down, and all around. To participate all you need is a Smartphone. Download a free 360° photo tool like the Google Street View app and get started. Check out these 360° media examples for ideas and inspiration. What story should you and your learners tell? Your story should relate to the SDGs and the ideas discussed with your community. Share your 360° work on social media using the hashtags #MYWorld360 and #SDGs. You can also submit your media to MY World 360° by 5 June for July events and by 15 August for September events. Where can you get more information about MY World 360°? Check out the website, FAQs and programme guide here and be sure to complete the online Educator interest form if you would like to get involved. We look forward to seeing some South African entries included in the showcase. Are you keen to try some basic coding in your classroom? Perhaps you have already done the Hour of Code with your learners, and now you are ready to move on to something a bit more challenging? 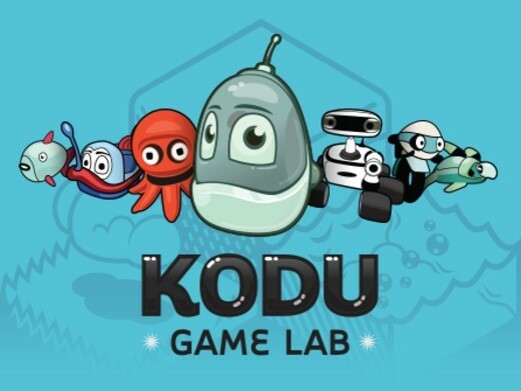 Why not give Kodu a try? 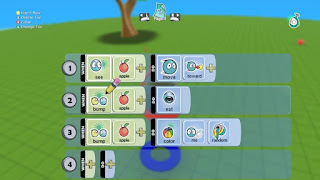 Kodu lets students create games on Windows computers using a simple visual programming language. Through making games, students also have opportunities to express themselves creatively, solve problems and tell stories. 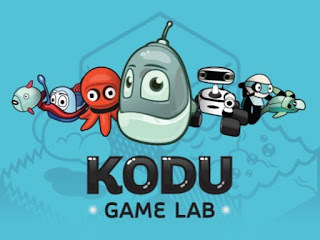 If you are new to Kodu, check out the Microsoft Virtual Academy in which SchoolNet's Megan Rademeyer discusses Kodu basic's with TechTeachers Matthew Hains. 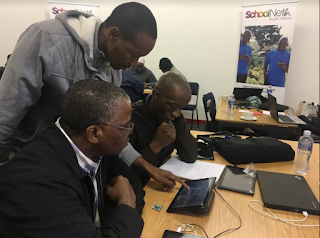 In this session, Matthew gives some good tips for making this free tool work in the South African context and on pretty much any Windows computer that has connectivity. You can also find pointers in the Introduction to Kodu course on the Microsoft Educator Community. Please let us know how you have used Kodu with your learners. We would love to feature South African lesson ideas for other teachers to try. Physical computing involves interactive physical systems or devices that can be programmed through software. That sounds very high-tech - but basically it involves bringing coding to life by programming something that you can touch to do something. For example, if you have a Microbit you can use a piece of tape to create into a fancy bracelet that flashes a message. Or if two people each have a Microbit - these can be programmed to make a symbol for either rock, paper or scissors so that a digital version of this classic game can be played as the Microbits are shaken. 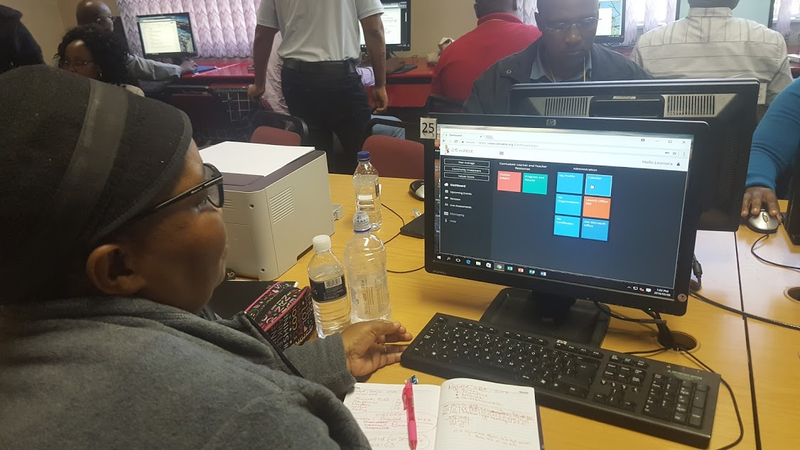 In our Physical Computing in the Classroom Microsoft Virtual Academy, SchoolNet SA's Megan Rademeyer discusses a range of physical computing ideas with Matthew Hains from TechTeachers. One of the main points we discussed was how to make physical computing work in schools that don't have access to resources or a computer science teacher. 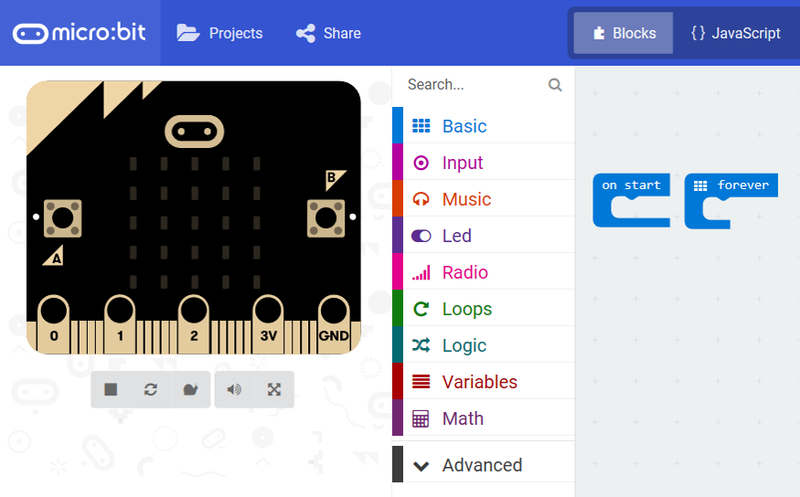 Matthew showed us how you can still try physical computing without tools like Microbits or Adafruit, by going to the Makecode website and coding a virtual Microbit. There are a range of great activities to try that don't require any formal computer science training to follow. 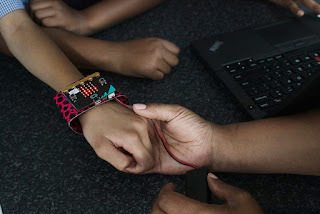 Please check out the course on the Physical Computing for the Non-Computer Science Educator course on the Microsoft Educator Community for some more pointers on this topic. Be sure to send us some pictures of your learners trying out physical computing so that we can share your lesson ideas with other teachers.